The steak and kidney pie is a typical British dish with a filling of diced beef steak and beef (ox), lamb's or pig's kidneys in a thick sauce. It is often, but not always, a one-crust pie, which means that the filling is covered but not completely enclosed by the pastry. Left: A steak & kidney pie, as served in a pub. Besides being made fresh in a kitchen or a restaurant, food processing firms offer this foodstuff frozen in a box, or canned (in a tin). Large cans even come in the size and shape of regular pie pans. The sauce typically consists of beef broth, flavoured with salt, pepper and parsley, onions, and thickened with flour, cornstarch or beurre manié. 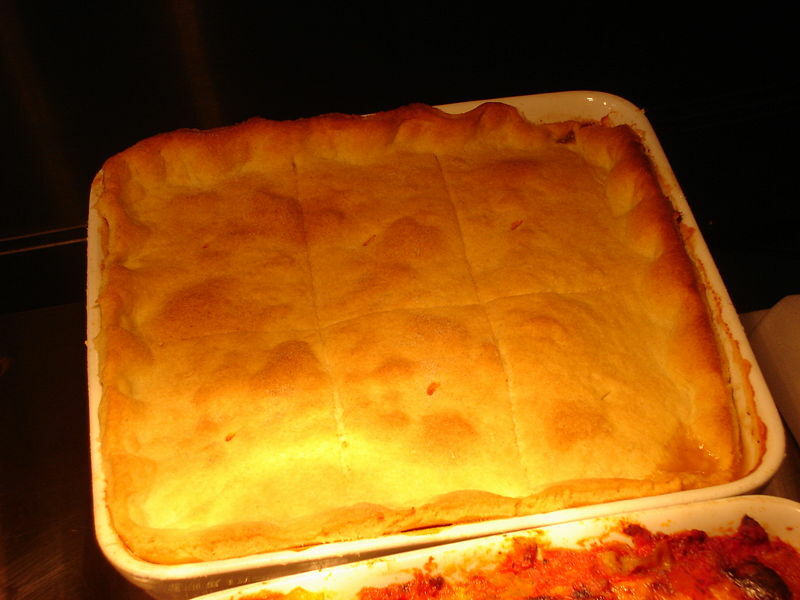 Two-crust steak and kidney pies are best made with hot water crust pastry, which is less likely to get soaked in sauce, but one-crust pies may also be made with puff pastry or shortcrust pastry. Steak and kidney pudding is a similar dish in which the contents are placed into a pudding dish lined and covered with suet pastry. The pudding is then steamed for several hours.